At its sixth edition in 2017, Osseo, the International Congress on Bone Conduction Hearing and Related Technologies, brings together surgeons, audiologists, industry specialists, researchers, and academics within the field of bone conduction. Cochlear’s unique implant and sound processor technology, and the clinical studies that attest it, as well as new products are some of the topics that will be discussed in the four-day event that sees participation from all over the world. A special focus this year is on the clinical evidence supporting the benefits of Cochlear’s Baha® 5 System, the most complete osseointegrated hearing solution on the market. The clinical evidence will present the proven benefits of Cochlear’s Baha® Attract System, and Baha Connect® System, in terms of hearing performance, aesthetics, and reliability. A platinum sponsor and one of the founders of the event, Cochlear participates at the Osseo congress as not only an industry leader, but also an industry creator. A special satellite symposium dedicated to its 40 years of innovation will provide a compelling insight into bone conduction hearing, and the latest technologies that have the opportunity to further improve hearing outcomes for people with conductive hearing loss, mixed hearing loss and SSD Osseo takes place 17 – 20 May 2017 in Nijmegen, the Netherlands. Nijmegen is home to one of the first centres in the world to use the Brånemark’s method – the bone conduction hearing implant, in 1987, ten years after Mona Andersson became the world’s first recipient of a bone conduction implant. Anders Tjellström, the pioneer of the bone conduction implant surgery, and the surgeon who performed the first implant, is one of the honorary guests at Osseo 2017. We will return with updates after the congress. An annual event that has taken place in the US every May since 1927, “May is Better Hearing and Speech Month” was started to raise public awareness, knowledge and understanding of various forms of communication impairments including hearing and speech. Hearing loss is one of the world’s most spread epidemics, affecting more than 360 million people, in all stages of their lives. 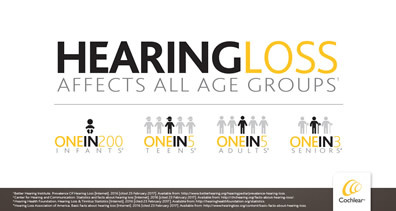 A staggering 32 million of these are children, and in about 60% of these cases, hearing loss is preventable. However, hearing impairment remains widely unaddressed, either due to embarrassment or lack of awareness. Therefore, educating people on the matter and understanding the need for action is extremely important in order to not only prevent, but treat, a disability that can have negative effects on those affected and the ones around them. Hearing loss is linked to depression, social isolation, reduced job performance, and impaired memory, among a wide array of effects. With hearing loss becoming more common as younger people lose hearing due to noise exposure and baby boomers age, Better Hearing and Speech Month has become even more important as a means of reaching those reluctant to have their hearing tested. Every May, Cochlear, volunteers, and clinic partners join the nationwide awareness program to help spread the word about hearing loss and hearing loss solutions through the Million Ear Challenge, a social media event that aims at reaching two million people in 31 days. The Million Ear Challenge informs the public about hearing loss and encourages people to engage in this joint effort to support the Better Hearing and Speech Month. When two million people are reached, Cochlear will make a donation to Hearing Charities of America and the Cochlear Implant Awareness Foundation to help support people with hearing loss. Want to join the Million Ear Challenge? Find out how you can get involved.